My favorite aspect of this book is it's written with a sensitivity to the crazy New England climate. There are so many great ways to build, but what works in California will not work well here. 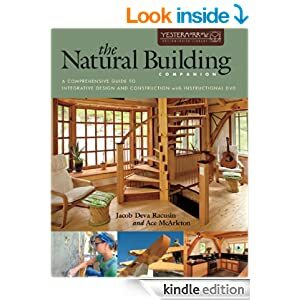 They also differentiate between natural building and green building. Natural building seeks to remain connected to the materials near the build location and minimize the carbon input required to transport a green product. For example, bamboo flooring is a green product, especially when compared to cement, but when the transportation carbon deficit of bamboo is realized in the comparison, a shipment from southeast Asia, across the Pacific, then on rail or truck to New England, cement's CO2 contribution is actually lower. The natural builder also looks to avoid persistent chemicals and plastics, thus turning away from foams and chemicals and turning towards non-volatile and minimally processed materials. In their own business, they use timber frame for the structure, which can be locally harvested and milled, and straw bales for the insulation, which can be harvested in nearby New York State or Quebec. They prefer clay plasters, natural paints, and wide plank floor boards. They are not against blown cellulose and find it the best minimally processed form filling insulation available. They also describe clay slip straw infill and clay slip wood chip infill. I've been intrigued by the wood chip clay slip walls and wrote about them before. The resistance to heat flow, the R-value, is not that great with this system, although they know of a builder who has used this wall system in the NorthEast. One idea they mentioned, which sounds really cool and has been tried in Canada and Ohio already is the addition of blown cellulose on the outside of the straw bale wall, which brings the whole wall R-value up over 40. This book is full of cool ideas and should be picked up by anyone who sees the need to build differently in our changing world.